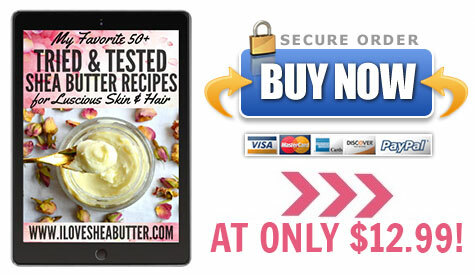 My Favorite Tried & Tested Shea Butter Recipes Ebook - beautymunsta - free natural beauty hacks and more! Are You Head over Heels in Love with Shea Butter?! My love affair with Shea butter began as soon as I started my natural health journey as a teenager. I got immersed in coconut oil, essential oils and clean eating. When I discovered Shea butter, I was fascinated and over the moon because this rich creamy gift of Nature, full of active vitamins and nutrients, was really working wonders on my skin and hair! I would say Shea butter has had a powerful impact on my hair growth journey and my own natural skin care routine. It’s safe to say I’m head over heels in love with Shea butter! Today Shea butter is an integral part of my life and I wrote this book in the hopes of making you fall in love with Shea butter too! All recipes in this book are carefully formulated through extensive research and experimentation. I hope you will like them as much as I do! 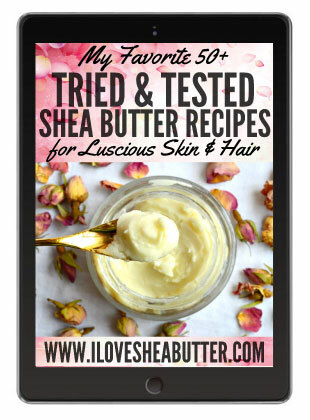 My Favorite Tried & Tested Essential Shea Butter Recipes for Luscious Skin & Hair is an exciting eBook that contains 50+ healing recipes with Shea butter, informational and nutritional facts, beautiful photos, tips and lots more! The recipes are divided into 3 categories; Face, Body and Hair and come with ingredient profiling, exact measurements, photos and details with step-by-step directions to help you create flawless products at home. PS: In the first few chapters, you’ll find some exclusive information about the history of shea butter through time, its uses in beauty care and its rich nutritional profile! More Shea Butter Goodies for You! This is a digital eBook, currently available in PDF format. 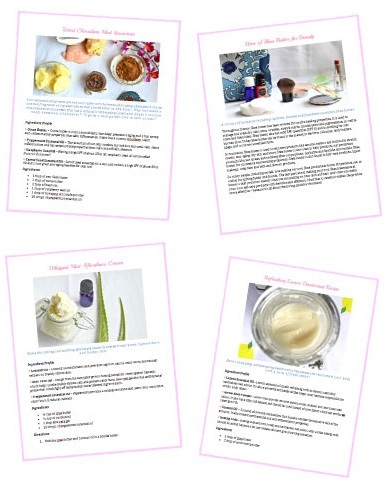 It’s not a print book but an eBook which when you buy, will immediately be able to download, through a link sent to your email, and view all 50+ of the amazing rejuvenating shea butter recipes!